Healthy Upma and Poha make a healthy Breakfast! healthy upma recipes. healthy poha recipes. Packed with iron and carbohydrates, poha is an all-time favourite breakfast option for many of us, and the same goes for energy-packed upmas too. But, variety is the spice of life and it rules these desi nashtas too! So, here are some innovative poha and upma recipes to make your breakfast time more fun and exciting! Colourful, fibre-rich veggies and protein-loaded sprouts adorn these recipes, along with spice powders and other ingredients used to jazz up simple poha and upma in a way that makes them all the more nutritious and tasty too. The recipes in this section for upma don't have any rava added to them. Hence we have a small but healthy collection of recipes. In one case we have a jowar upma recipe with some rava in it. But the jowar is the main ingredient making the recipe healthier with also the addition of vegetables. NOTE that also try and add vegetables as they increase the fibre to your upma or poha. Why the classic poha recipe is healthy? Poha health details. High iron count (2.67 mg in a cup) of poha. Most people prefer eating poha for breakfast. The reason behind it is its high carb count. Poha helps us accomplish nearly 5% of potassium requirement which will control blood pressure and sustain cardiac health and further aids in controlling blood cholesterol too. Cons. Due to high carb content it is not good source of diabetic food and weight loss due to lack of fibre. Have the classic Maharashtrain poha recipe and drop the sev in the garnish to keep it healthy. The best way to consume poha is to toss in some vegetables that increase the fibre count and make it way healthier. So have this green peas poha recipe. Other options are tomato poha recipe. Tomatoes are a powerful antioxidant, super rich in Vitamin C, good for heart. Tomatoes are a Pregnant women's friend and are rich in Folate or Folic Acid which helps your body to produce and maintain new cells, especially red blood cells. See why sprouted matki is good for you. Matki sprouts abound in fiber and thus form an ideal choice for weight watchers, diabetes, heart disease etc. The process of sprouting increases the protein count of matki by 30%. Try this sprouted matki poha recipe. Another healthy variation is mixed sprouts poha recipe. See why oats are perfect for healthy upma. Oats are a great source of protein for Vegetarians. It is rich in soluble fibre, which helps lower blood LDL cholesterol, the so-called "Bad" cholesterol. Whole Oats have an antioxidant called Avenanthramide (a polyphenol from oats) which helps lower blood pressure levels. This oats upma recipe is made with carrots, green peas and onions which makes the recipe even healthier. See why quinoa are perfect for healthy upma. Quinoa lowers cholesterol and heart diseases. The soluble fibre in this grain gains the credit of reducing the total blood cholesterol and LDL (bad cholesterol) levels in our body. Harnessed with nutrients like protein, calcium, phosphorus and magnesium, quinoa has been considered as the bone-building power grain. This quinoa veg upma recipe is made with carrots, green peas and onions which makes the recipe even healthier. 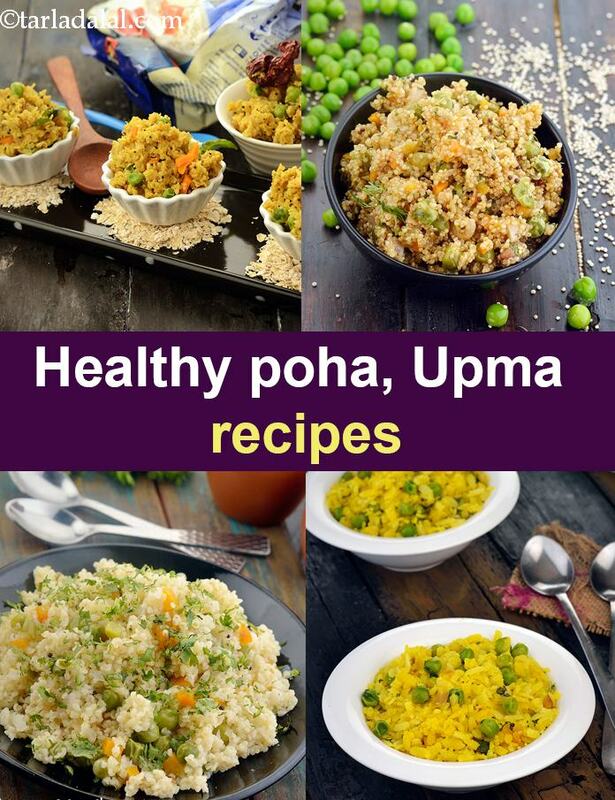 Enjoy our healthy upma recipes. healthy poha recipes and other healthy breakfast articles below.